Godetevi la bellezza tranquilla di Copake Lake in questa casa estate solo 2+ ore da New York City. A soli 200 metri di distanza dal bellissimo Lago Copake con spiaggia privata di sabbia, zona piscina protetta, e zattera. Inoltre è possibile utilizzare molo privato, se si dispone di una barca o kayak. Lovely, cozy home close to lake. Cute surrounding towns! The property was extremely clean and well stocked. We really enjoyed our stay. The home is on the small side but we had 5 adults and 2 dogs and still were very comfortable. The home has only 1 air conditioner and we were there when temps hit 95 degrees. Fortunately we brought some fans to direct the cool air into the bedrooms so for the most part we were comfortable. The rap around deck was great and there was plenty of deck furniture. The only downside to the trip was the lake dock. While we were there the dock collapsed. They repaired the dock the next day so that was great. I would suggest that the owner seriously considers to replace the dock soon. By the way the fishing was GREAT! We thoroughly enjoyed the cottage on Copake Lake. Comfortable, plenty of room for 6. Well appointed. Quick walk to the (beautiful clear water) lake. Played some really good croquet on the “lawn”. Beautiful setting in the private, tree-shaded community. Zero complaints. Thank you!! My family had a lovely, restful vacation here. The lake is gorgeous, the local farms provided amazing produce and meat for superb grilling and the comfortable cottage rounded out the amazing time we had. Local neighbors were friendly and welcoming, providing helpful hints on local attractions. Susan also provided great ideas for fun things to do. I'm a cyclist, and the gravel back roads provided hours of scenic backdrop that never got old. The local MTBing was also a treat. 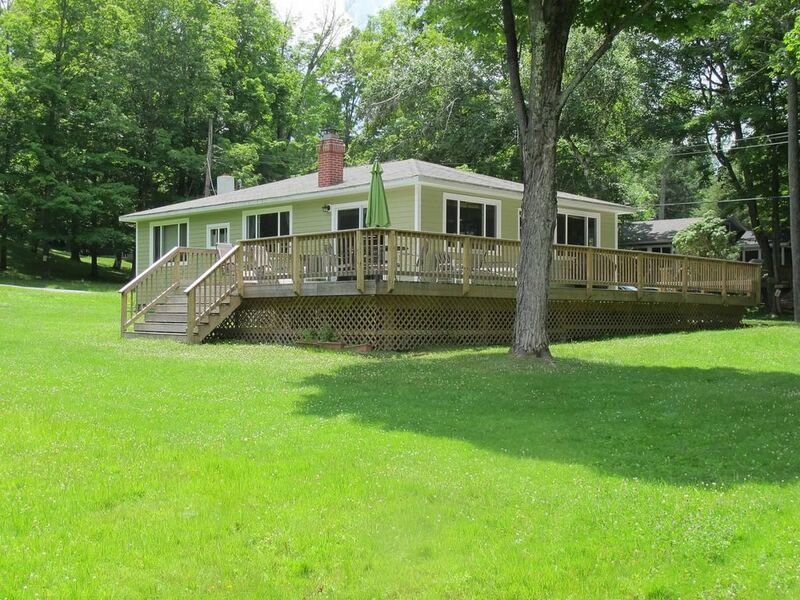 We took away some very fond memories and will miss our time at Copake Lake. We had a great time at this vacation house. There were 6 adults and a 3-year old in our party, and everyone enjoyed big deck, huge backyard lawn and a small private beach, which was only 2 minute walk from the house. Owners sent us a guide that outlined every little detail about the house, so we didn't have any problems finding, opening or turning things on/off. The weather was gorgeous, and it wasn't too hot, which I think might potentially be an issue during peak heat in July-August, as the place only has AC installed in the living room. The house is very well maintained and it had everything we needed. I would highly recommend it to anyone looking for a quiet and relaxing vacation in Berkshires. The house was charming and lovely! It felt like I was visiting my grandfather's house for a family reunion, very warm and welcoming. I did however think, from the description of the property and the pictures that the lake was butted up to the back of the property of the house, but it wasn't a long walk to the lake anyway. There was an added bonus of having our own private dock to use as well as the HOA private beach. There was a place to rent a boat, reasonably priced too and the fishing was great! The neighbors were all nice... one was a little meddlesome, but all were friendly. I would definitely return to this house. We ventured to the Taghanic (spelling?) falls and did a nice hike followed by a dip in the frigid water...it was beautiful! Finally, our dog came with us too, he was only allowed to swim in the lake by where the private dock was and there were a lot of other dogs around, all were friendly, but roamed around without leashes. They wandered onto the property that we were staying at without their owners, who I'm sure didn't realize that the dogs were leaving presents without their knowledge. All, in all, it was a good experience. Rates are subject to change until reservation is confirmed. Bookings canceled within 0-13 days before the Check-in Time will not receive a refund of the total rate. Bookings canceled at least 14 days before the Check-in Time will receive a 50% refund of the total rate. Bookings canceled at least 30 days before the Check-in Time will receive a 100% refund of the total rate. In the event of cancellation, cleaning fee will be refunded in full. The property damage protection fee is not refundable for a cancelation. If the Owner is able to rebook for the entire period of the canceled reservation, the Tenant will receive a 100% refund. If the Owner cannot rebook for the entire rental period, the Tenant will receive a refund according to the cancellation schedule stated above. Cancellations must be made by 12:00 PM (noon) Eastern Time Zone on the appropriate day.